The adventure of our lifetime started with a simple premise: “Let’s go for a ride south!” At the time Jon and I were architects based in Romania. Going south meant unplugging from our career and switching continents to travel into Africa. So we strapped our essentials on a Yamaha XT660Z Ténéré and left. The serendipity of specifics would unfold along the way. 200 days later, we both felt on our turf. One of the perks of slow overland travel is that it gives you time to adapt. You learn to spot bivouacs in the wild and to negotiate your food in languages you don’t really speak. A nomadic lifestyle becomes second nature. We loved our time in West Africa and thought that Nigeria was a blast. 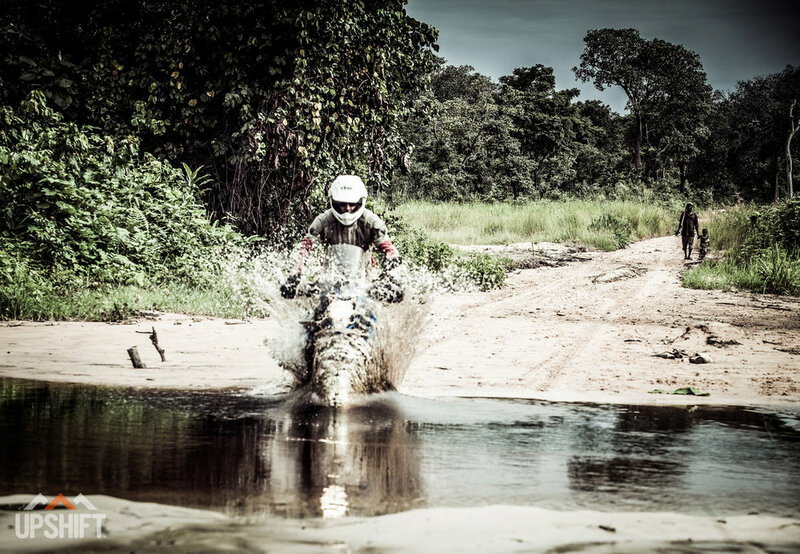 We narrowly avoided trouble in Cameroon, and crossed the Equator in Gabon with a huge grin behind our helmets. Everything was going so well, and then it wasn’t, just like that. We had arrived in Matadi, a dusty town in the Democratic Republic of Congo (DRC), formerly known as Zaïre. It was two weeks before Christmas and we needed a transit visa for Angola. To our shock, the Consulate seemed closed. An old guard informed us that in the aftermath of presidential elections and violent clashes in Kinshasa, all Angolan consular services had been suspended indefinitely. The same afternoon I learned I had malaria. Under other circumstances that would have scared the hell out of us, but we had bigger problems than that. We were stuck in limbo, with one possible way out: ride across a country roughly the size of Western Europe, on roads that don’t really exist on any map. 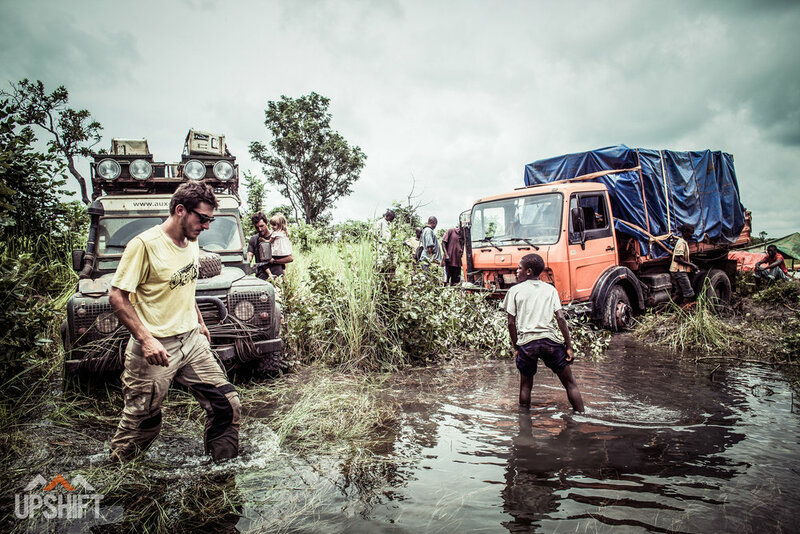 The next day we met with other travelers who shared our fate and with Congolese truckers to figure out a plan. From Kinshasa to Lubumbashi, they said, “You only have the Nationale 1.” This spongy unsealed track of bog and sand spans 2,500 kilometers and connects the Western coast of Africa to the East. The local trucks make the journey in 3 to 4 months. We would have to do it in one, smack in the middle of the equatorial rainy season which unloads on DRC, the most thunderstorms of any other country in the world. “Impossible,” said the truckers. 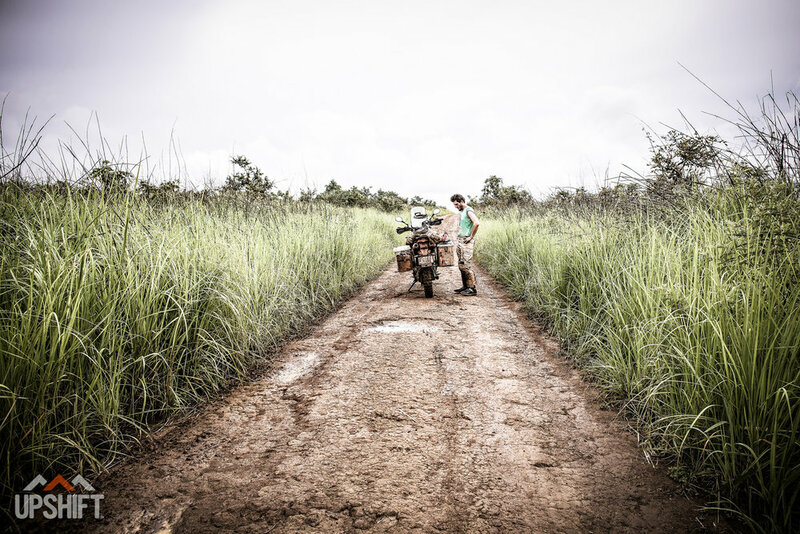 High on adrenaline and faced with the prospect of unlikely success, or potential failure, Jon, Jacques, Delphine and I looked at each other, “We can do this!” We were of course grossly underestimating how long and how hard a journey across Congo can be. For the next four weeks we disappeared in the gut of Africa: a primal realm of steamy rain forests, barefoot kids, torrid days, and flashy sunsets. Right off the bat the journey demanded sacrifice. A rooster, two chickens, a duck and a bat were all flattened by our French companions’ car. They were the first victims of a road, which after a 530kms stretch of tarmac, was uninterrupted jungle. Out of Kikwit, we followed the Congo river, the color of coffee with milk and miles wide, which snaked its way through wilderness. The main road was an oozing scar of bog that sank the foot up to the knee. Dozens of paths, some feet wide, stemmed into waist-high vegetation. The locals called these “deviations for small vehicles.” To decide when to take them and when to avoid rolling into the biggest mistake of our lives, we had to inspect each option on foot. Congo was like a giant puzzle that we needed to somehow figure out. African road is usually covered in people. Everything happens along: some walk or cycle about their daily business, some trade or doze off on bags of charcoal, awaiting transport. We were rarely alone, and if we stopped, even in the middle of seemingly nowhere, far from the mud-and-dung villages, it took a few minutes for people to pop out of the bush. Sometimes villagers eagerly tried to guide us. A noisy big motorbike was like a UFO, and soon our popularity proved helpful at police checkpoints, where we were able to negotiate our way through with a smile. The AK-47-bearing militia often forgot to ask for bribes, or even for our papers. “What is your mission?” they asked. Because in Congo, see, there are no tourists. To leave home and wander aimlessly across a foreign land sounds nuts to people who struggle for their bare existence. And so we struggled too, with feelings of shame. Even if we had sacrificed a lot to afford the trip, we could have bought an entire village with just what we were carrying on the bike. But in spite of rife corruption and brutal weather, the Congolese have never lost their resilience. They are a special breed of people, indeed. They were our companions: barefoot women with Sisyphean weights on their heads, gruff men who pushed up to 200 liters of petrol on chukudus, and endless rag-tag troupes of ruddy faced tykes. And then there were the heroic truck drivers. Surviving on bland cassava porridge for months, they were never too fatigued to dial up the energy required to carry entire truckloads on their backs when the road was steep. In Sokele we found 3 trucks buried axle-deep in a swamp. Cans of palm oil, piles of cassava flour and packs of biscuits littered the ground. Covered in mud from the waist down and in sweat from the waist up, 20 men were scrambling to build a bridge out of sandbags and scraps of wood that they’d been cutting for the past 3 days. “Vous voyez comme nous souffrons?” (You see how we suffer?) they asked. For them, this road of unbridled beauty, poverty and inequity was their life, not a once in a lifetime adventure. While we were carving a way out, they had no choice but to stay in. As we reached the fringes of diamond country and the home of the very poor, everyone remained super friendly. This was a very different world that neither of us thought still existed outside the issues of National Geographic. The land, which became all too familiar to different parts of our bodies, was rough. Our days were spent franticly operating shovels, a winch, chains or whatever other tool we could harvest to extract ourselves from random trouble. When we were able to ride for more than a few kilometers, we still had to stop and fix the damaged vehicles. As the road kept changing and the tools started to inevitably fail, our nerves and imagination were tested to new extremes. Pitching the tent became an automatism, and we slept like dead people, even if our shelter was leaking and the ground was rarely flat or dry. Our quads constantly pulsated with lactic acid. We showered and did our laundry with rainwater. We drank from wells and rivers. We did it like the Congolese. On Jon’s birthday we arrived in Tshikapa, and settled on the premises of yet another derelict catholic mission from the 60s. It rained softly inside our tent. I had no more dry stuff to change into, so I hit the market in search of anything redeeming. I usually bought food directly from farmers, stopping on the way and talking them into selling us some of their pineapples, corn, and whole bunches of bananas. Most markets broke my heart, disappointed my hunger and left me feeling guilty of clearing the supplies for many miles around. But in Tshikapa, besides the usual display of charcoal, green tomatoes, dry fish and termites still kicking in buckets, I found Skol sold in 750ml bottles and cake. Sometimes you think you must figure out your life’s purpose, when you really just need some sugar and cold beer! 20 kms before the town of Mbuji Mayi, our caravan hit what could only be described as a canyon. A thick layer of crimson clay lay on the bottom. Our tires slid on it like skates on ice. When it looked like nothing else could happen anymore, Yamaha’s chain snapped. It had over 15,000 kms on it. 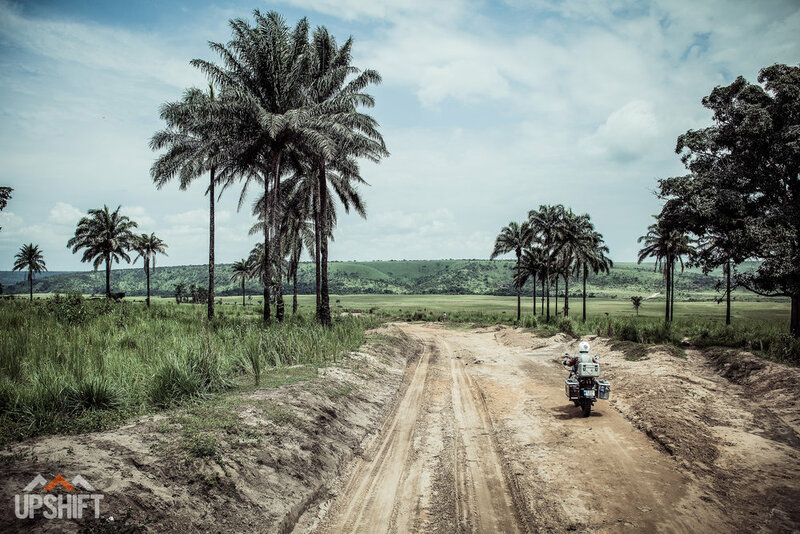 With the off-road detour across DRC never part of the original plan, we didn’t carry a spare. We tried to tow, but the track was like wet soap. Jon dropped the bike and flew like Superman into a tree. I ran to him. He had only broken a brake lever, and no bones. It was time to stop and think. We were at least 200 kms away from any living soul. We pitched camp in the middle of the road, the only flat surface as far as the eye could see, cut the last avocado and wiped the Tsetse flies off our eyes. Jacques looked under the Defender’s bonnet: “Guys, the engine is leaking.” The mood at bivouac was grim. But a night of bush mechanics later, we had patched both vehicles. We had mended the leaking pipe with some glue and fabricated a chain link from some scrap metal and two bolts, a fix that lasted for another 750 kms. When we hit the laterite of route N38, our GPS promised a happy ending. We arrived in Lubumbashi many pounds lighter, with our gear marinated in reddish Congolese soil that one scrubs with little effect. Both felt a little nostalgic. The Anopheles-infested swamps and sky-high termite mounds of the Congo were behind us. The adventure was over. About us: We are Jon and Ana, a Romanian globetrotting couple of architects. 6 years ago we unplugged from our career and embarked on our first big overland ride: 14 months 2up around Africa. Since then we traveled to over 60 countries and regions, including the Silk Road to Mongolia by motorbikes and cycling across China, Tibet and the Middle East. We write about our travels at www.intotheworld.eu and on Instagram at 2intotheworld.